Professional installation of commercial UV window tint film. Call Alta Mere window tinting Tulsa. Same Tulsa location since 1994! 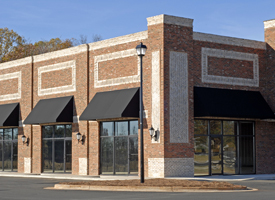 When it comes to your business, it is important to protect your building and the people and things inside of it. A solution? SmartView window tinting is one of the easiest ways to do just this. When you partner with us, we handle everything from your design consultation to installation. All that you'll need to do is make your selection and enjoy the many benefits acquired from window installation. When it comes to commercial window tinting, the benefits are plentiful. Need some convincing? Take a peek below. Go Green – you don't have to completely revamp your building's design to go green. The simple addition of window tinting is a surefire way to save energy. In fact, this blocks almost 83% of the sun's heat, helping lower your cooling bill when it's warm outside. Increase Productivity – when you are working in a commercial space, the little things can make a big difference in your comfort and, ultimately, productivity. Glare reduction and a cooler space will help achieve just that. Enhanced Entertainment & Security – long gone are the days of annoying glares on the television screen or computer monitor. Our effective window tinting solutions will make your office virtually glare-free. You will also have an added layer of protection with the addition of this window treatment, keeping unwanted onlookers for scoping out electronics and other items in the office. Shatter Guard - in the event that stormy weather sends a tree limb flying through your window, you can rest assured that our window tinting solutions will prevent shards from shooting everywhere better protecting you and your business. Improved Decor - window tinting isn’t limited to boring tints. Colors. Patterns. Frosts. These are the stylistic elements you can select from, customizing them in accordance with your individual needs. When it comes to window tinting, the experts with SmartView Window Solutions are prepared to satisfy your commercial space needs. Because of our full-service business model, customer satisfaction is guaranteed. How can commercial window films be cleaned? Although most window films are scratch-resistant, you still need to take extra care when having them cleaned. The key? Avoid using cleaning agents with granulated textures, as this makes the film more susceptible to damage. Are any types of windows unable to be tinted with films? 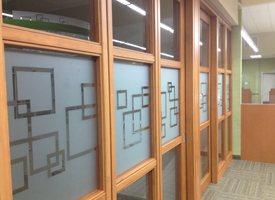 Yes, there are a few varieties that are not suited for the application of window films. Wired glass windows, as well as patterned and textured glass are not ideal candidates due to their uneven surface.